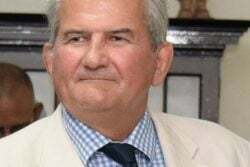 PPP General Secretary Donald Ramotar on Friday said the calibre of party members is on the decline and he lamented that new members did not have the same level of commitment as those of the past. 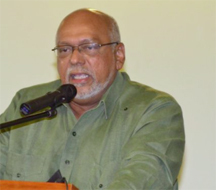 Delivering the General Secretary’s Report at the 30th PPP Congress at the J.C Chandisingh Secondary School at Port Mourant, Berbice, Ramotar added that the party had to be more “selective” in attracting members. He said that there was a lack of education on the party’s historical context and he noted too that the “political ideology” needed to be taught and that the party had dropped the ball in this area. He noted that the party had values that were entrenched in family and community and as a result looking to recruit members who shared those values were essential to the party’s longevity and survival. Ramotar also said that activism had to find a greater role in the party. However, he added that getting back to the grassroots organisation of the party would be more attractive when recruiting members. The party has blamed declining work at the grassroots level in part for the loss of its majority in the National Assembly at the last general elections. Ramotar also focused on the current state of private enterprise in Guyana and said “patriotic capitalists” had a further role to play in the development of the party and the country. He noted too that the party had done a good job in providing inclusive policies to tackle Amerindian issues. Ramotar also focused on late President Dr Cheddi Jagan’s legacy, while affirming that the party would remain steadfast to the party founder’s vision. 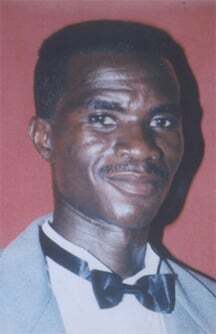 Ramotar quoted heavily from Jagan to rile up the delegates and to criticise opposition groups, the AFC and APNU. He used common Jagan phrases in both his General Secretary report and during his feature address during the opening ceremony. The President held steadfast that Jagan’s legacy was the PPP/C and that going forward all party members had to be educated and prepared for changes in the political situation. Former party members and most notably Ralph Ramkarran, Moses Nagamootoo and Khemraj Ramjattan, have all said that the current party leadership has strayed from Jagan’s ideals, especially in its handling of corruption. Last year, during a memorial service for Janet Jagan at Babu John, daughter Nadira Jagan-Brancier also suggested that the “certain elements” in the party had moved away from the values of both Cheddi and Janet Jagan, which had held the party together. “…If the PPP is saying that they are following Cheddi Jagan and Janet Jagan as a living guide, the only way they could follow Cheddi Jagan and Janet Jagan as a living guide is to return to basics, return to who this party is, which is a working class party. Obviously you have to support other people, but the base of the party is a working class party; get back to being a non-corruptible party so that people can’t point a finger and say there is so much corruption,” she said. “To me the most important point [is that]… my parents had very, very, very high moral…standards [and] this I find is very lacking in many of the leaders. My parents… [were] probably the most incorruptible people you would ever find; their honesty and integrity were of very high standards. That unfortunately does not exist, or I don’t see it in many of the leaders of the party and of the government,” she said to loud applause from those present.